Micro Student Symposium 5/6 at @ucberkeley w/ Keynotes by Victoria Orphan and Michael Laub – microBEnet: the microbiology of the Built Environment network. 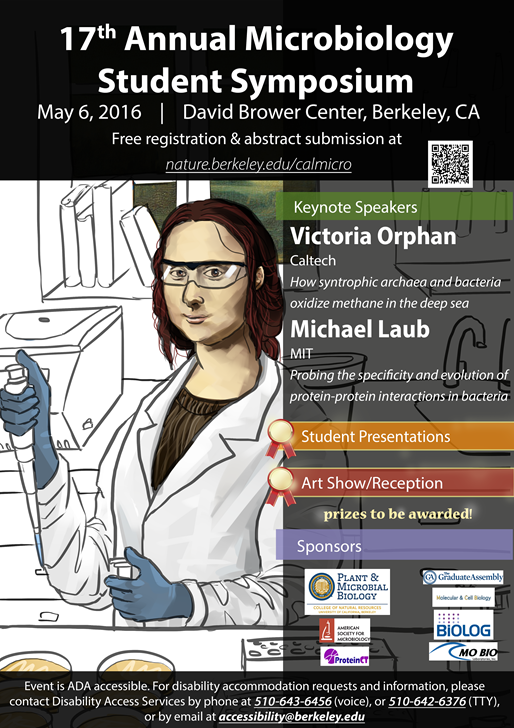 The Microbiology Student Group at UC Berkeley welcomes you to join us for the 17th Annual Microbiology Student Symposium (MSS) on Friday, May 6, 2016 at the David Brower Center in Berkeley. This year, our keynote speakers are Victoria Orphan from Caltech and Micheal Laub from MIT. The MSS provides a forum for students researching all topics in microbiology to present their research to an engaged group of students, scientists, and members of the general public interested in microbiology. In addition, attendees will have the opportunity to present their microbiology-inspired art and engage in open dialog about how microbiology and creative pursuits can positively influence each other during the reception. Please register now to attend the MSS and submit your abstract for talks/poster presentations and/or microbial art. Prizes will be awarded for the best posters, talk, and art! Please visit our website, Facebook page, follow us on Twitter, and contact us at microsymposium@gmail.com if you have any question! We look forward to seeing you at the 17th Annual MSS!